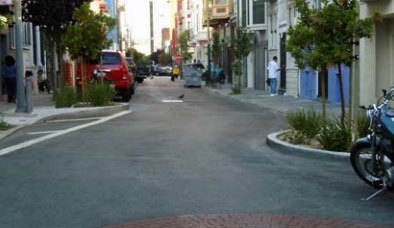 Some SOMA alleyways are becoming pedestrian walkways, calm refuges from wide roads and fast traffic. Explore where these and other fixes could help make it easier for people to walk to parks and open space. We’ll walk the alleys, visit a park and beautiful community gardens, and think about how to make central urban neighborhoods like this one greener, safer, and more welcoming for everyone. Co-sponsored by SF Planning Department’s Green Connections project and in partnership with the Southern Station Community Police Advisory Board. WalkSF: Potrero Hill to the Blue Greenway: Grey to Green to Blue — with Chocolate Sprinkles!